Born in Toronto, Ontario Dale played junior hockey with the Cornwall Royals as a centreman winning the Memorial Cup in 1980 and 1981. He was selected to the all-star team both years and won the George Parsons trophy (for most sportsmanlike player) in 1980. In 1981 he was the MVP and was voted Major Junior Player of the Year as well. Dale was selected in the 1981 NHL Draft first overall by the Winnipeg Jets and was named the Calder Memorial trophy winner as NHL Rookie of the Year in 1982. He was an NHL second all-star team selection in 1985 and was runner-up for the Hart trophy that year. 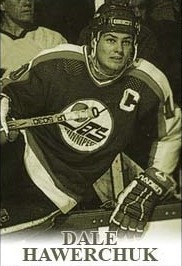 Dale played nine seasons with the Jets and is their all-time leader in goals with 379 and points with 929. He retired from the NHL in 1997 with 518 goals and 1409 points in 1188 games including stints with Buffalo, St. Louis and Philadelphia. He was inducted into the Hockey Hall of Fame in 2001.